SIDNEY – A Fort Loramie man has been indicted on three charges regarding an allegedy abduction case by the Shelby County grand jury Thursday. Tyler A. Hurst, 31, 63 Eastview Drive Apt. 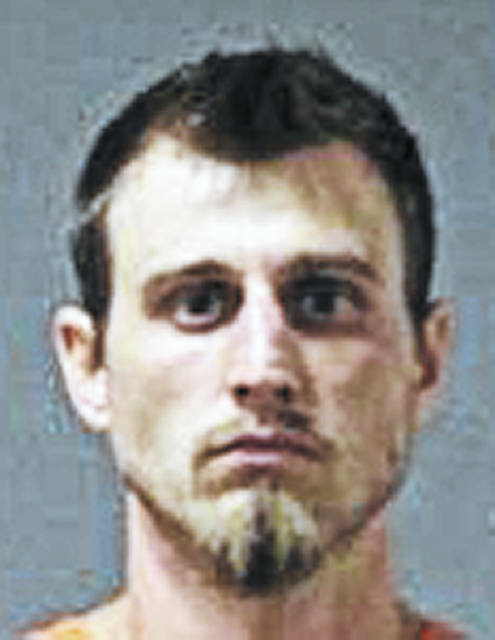 5, Fort Loramie, has been charged with abduction, a third-degree felony, violating a protection order, a fifth-degree felony, and obstructing official business, a second-degree misdemeanor, following an Aug. 19 incident in Sidney. Hurst was one of 22 people indicted. They will be arraigned Thursday, Aug. 30, in Shelby County Common Pleas Court. According to Sidney Police, Hurst entered a residence at 623 N. Ohio Ave. around 9 a.m. with an adult woman at the home. The reports noted Hurst did not use force to enter the premises. Online court records show Hurst forcibly prevented the woman from leaving the house. He manipulated her into believing law enforcement officers were seeking her arrest. Already in place was a protection order the woman had against Hurst. Once police arrived at the residence at 10 a.m., Hurst ran from officers and later provided false information prompting the obstructing charge. Jamey L. Owens, 34, at large, was indicted with gross sexual imposition (GSI) and sexual battery, both third-degree felonies. Owens is accused of have sexual contact with a nine-year-old girl which brought about the GSI offense. The contact occurred between Nov. 1, 2014, through Dec. 31, 2015. He is also charged with sexual battery with prosecutors alleging Owens had sexual contact with a child from May 1, 2017, through June 15, 2017. Kareem D. Williams, 29, Columbus, Ohio, was charged with domestic violence, a fourth-degree felony, and obstructing official business, a second-degree misdemeanor. Williams is accused of body slamming a woman to the floor who was his roommate injuring her head. Online records note he has a previous domestic violence conviction in Miami County. He gave a wrong name while being arrested by Jackson Center Police. • Tariq Floyd Esom Hassan Vining, 21, at large, was charged with burglary, a second-degree felony. It’s alleged that on Aug. 3 Vining entered a home at 637 Marilyn Drive and stole a rifle. A person was home asleep during the burglary. • Justin E. Wiggington, 31, 339 ½ S. Highland Ave., was indicted for escape, a fifth-degree felony. He is accused of fleeing from detention at the Shelby County Jail while on the work release program on Aug. 8. • Devontea Devell Banham, 25, Indianapolis, Indiana, was charged with failing to comply with an order or signal of a police officer, a fourth-degree felony, for improper handling of a firearm in a motor vehicle, a fourth-degree felony, receiving stolen property, a fourth-degree felony, and, for driving under suspension, a first-degree misdemeanor. On Aug. 18, Banham is accused of fleeing Sidney Police with speeds exceeding 100 miles per hour. According to the police report, a loaded revolver was found in the front seat, and received the car he knew was stolen. He remains incarcerated at the county jail on a $10,000 bond. • Jessica L. Nafzger, 38, 232 E. Poplar St., was indicted on one count of illegal conveyance of a prohibited item into a detention facility, a third-degree felony. She was discovered with Methamphetamine on March 20 at the county jail. • Benjamin Franklin Sizemore Jr., 56, Lima, was charged with improper handling of a firearm in a motor vehicle, a fifth-degree felony, and, two counts of operating a motor vehicle while under the influence, both first-degree misdemeanors. He was arrested on Aug. 4 for drunken driving and having a loaded handgun. The report indicated Sizemore refused a breath test and had so in two previous cases. The refusal prompted the second operating violation. Court records state Sizemore has a previous drunken driving conviction in Lima Municipal Court. • Jeremiah D. Wilson, 38, 806 S. Main Ave., aggravated possession of drugs, a fifth-degree felony. He is accused of having Methamphetamine when arrested on May 27. • Alice Turner, 32, 522 ½ E. Court St., two counts of aggravated possession of drugs, and, possession of criminal tools, all fifth-degree felonies. She was arrested on Aug. 14 with Methamphetamine and fentanyl. • Lance Stout, 9233 Shaffer St., aggravated possession of drugs and possession of criminal tools, both fifth-degree felonies. He was arrested Aug. 9 with Methamphetamine. • Christy A. Williams, 43, 1915 Shawnee Drive, aggravated possession of drugs possession of drugs, and possession of criminal tools, all fifth-degree felonies. She was arrested June 18 with Methamphetamine and heroin. • Kenneth J. Williams-Anderson, 23, Antioch, Tennessee, possession of drugs and possession of criminal tools, both fifth-degree felonies. He was arrested Aug. 20 with marijuana. • Arthur J. Bennett, 30, 220 E. Clay St., possession of drugs, a fifth-degree felony. He was arrested June 29 with heroin. • Aaron Oskowski, 40, at large, four counts of aggravated possession of drugs, and, possession of drugs, all fifth-degree felonies. He is accused of selling Methamphetamine, Fentanyl, and, cocaine, on June 27 and 30. • Nicole L. Neal, 41, Springfield, Ohio, aggravated possession of drugs and possession of criminal tools, both fifth-degree felonies. She was arrested on Aug. 6 with Methamphetamine. • Justin Perry, 34, 212 S. Main St. Apt. 3, Piqua, aggravated possession of drugs, a second-degree felony, tampering with evidence, a third-degree felony, and, possession of drugs and possession of criminal tools, both fifth-degree felonies. He was arrested on Aug. 7 with Methamphetamine and heroin. He was also charged for trying to conceal the drugs from officers. • Ronnie Scholl, 39, 916 N. Miami Ave., receiving stolen property, a fourth-degree felony. Authorities believe he received and disposed of a motorcycle on July 19. • James E. Ferguson Jr., 43, 511 S. Wilkinson Ave., aggravated possession of drugs, possession of drugs, and two counts of possession of criminal tools, all fourth-degree felonies. Ferguson was arrested for selling Percocet and heroin on Aug. 13-14. • Tommy R. Beaver, 43, 1106 Roosevelt Ave., Piqua, passing bad checks. Beaver is accused of knowingly writing a fraudulent check to Mennard’s in Sidney in the amount of $3,591 on Nov.6. • Matthew W. Paladino, at large, failure to appear, a fourth-degree felony. He failed to appear at a final pretrial hearing on Aug. 16. • Brandon A. Carver, 29, 770 Foraker Ave., illegal conveyance of a prohibited item onto the grounds of a detention facility, a third-degree felony. He is accused of taking cocaine into the county jail on July 8.